Sales forces that simply communicate value to customers are doomed to fail - sales must begin to create customer value to survive. In today's markets, success can no longer be obtained by salespeople communicating the value of a product or service - it rests on the critical ability to create value for customers. Enter Rethinking the Sales Force. In this book, best-selling author Neil Rackham and international sales and marketing consultant John De Vincentis have created a breakthrough guide for sales and marketing executives. Rackham and De Vincentis help sales forces rethink and retool their selling strategies by introducing eye-opening insight for winning in the new marketplace. 'Of the many books published each year on marketing and selling, only a tiny fraction have anything new to say. This is one of them. It will radically change your thinking about your sales force, and even whether you need one' - Philip Kotler, Distinguished Professor of International Marketing, J.
L. Kellogg Graduate School of Management, Northwestern University. 'A compelling premise. 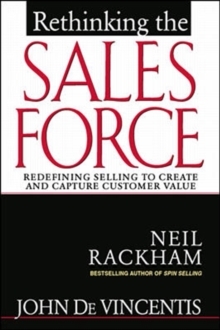 Without question, this is an important and useful book for companies serious about improving sales performance' - Chuck Farr, Former Vice-Chairman, American Express. 'Sales forces of tomorrow will need to be fundamentally different from today. This book provides an interesting and valuable window into the future of selling and what the next generation sales force will have to do to prosper' - Michael Graff, President, Business Aircraft, Bombardier Aerospace.